We’ve all been there, at a picnic or on a train, you remembered the bottle of wine, but not the corkscrew. If you’re at a construction site, the simple solution is to drive a screw into the cork and lever it out with the claw of a hammer, but in a pinch, here are a couple other methods. 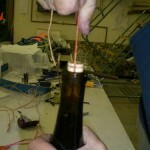 Open a bottle of wine with a piece of string (instructables.com). Do you really think I’d forget my corkscrew but remember my drunken Frenchman?! What do you think the odds are that I’d manage to make this work versus slicing my hand off with broken glass and walking home with a wine soaked shoe?